I sent a cassette tape of Adrian Rogers on Evolution to John Hospers in May of 1994 which was the 10th anniversary of Francis Schaeffer’s passing and I promptly received a typed two page response from Dr. John Hospers. Dr. Hospers had both read my letter and all the inserts plus listened to the whole sermon and had some very angry responses. If you would like to hear the sermon from Adrian Rogers and read the transcript then refer to my earlier post at this link. Over the last few weeks I have posted portions of Dr. Hospers’ letter and portions of the cassette tape that he listened to back in 1994, but today I want to look at some other comments made on that cassette tape that John Hospers listened to and I will also post a few comments that Dr. Hospers made in that 2 page letter. Anyone over the age of 40 who has ever studied philosophy is likely to have on their shelves at least one edition of the mandatory student primer, An Introduction to Philosophical Analysis, first published in the mid-1950s. Its author, John Hospers, who has died aged 93, was emeritus professor in philosophy at the University of Southern California. “I want to be remembered as a philosophical instructor who could clarify questions, and present good ideas clearly,” he wrote. He will also be remembered as one of the founders of the individualistic, anti-government Libertarian party in the US, which had links to the laissez-faire economists Friedrich Hayek and Alan Greenspan. He wrote one of the party’s key texts, Libertarianism: A Political Philosophy for Tomorrow, and, in 1972, was the first Libertarian party nominee for president. Many contempories considered him to be the first openly gay candidate for President but since his death his family have strenuously denied that he was gay. His campaign photograph had the heading “Break free from Big Brother”. Hospers and his vice-presidential nominee, Theodora Nathan, each won an electoral college vote from a renegade Republican elector. Hospers soon abandoned full-time politics for a return to academia. He was born in Pella, a small town near Des Moines, Iowa. Pella had been founded by Dutch religious refugees in the 18th century, and Dutch was Hospers’s first language, tulip gardens his aesthetic, self-reliance and Calvinism his religious codes. It was David Hume’s Dialogues Concerning Natural Religion that later helped him struggle free of the Dutch Reformed Church and engendered his interest in philosophy. His first boyhood love was astronomy. He would go to the nearby college observatory to view, and to show college students, the rings of Saturn and various double stars. When at college himself, aged 17, he was often delegated to replace the dean in giving astronomy classes to college seniors. After graduating with an MA in English literature from the University of Iowa in 1941, Hospers was offered a scholarship in philosophy at Columbia University, where he studied for a year under the British analytic philosopher GE Moore, who was a visiting professor. He got his PhD in 1944. His first book, Meaning and Truth in the Arts, published in 1946 while he was teaching at Columbia, was based on his dissertation. He wrote extensively on ethics and aesthetics, and taught philosophy at Brooklyn College in New York, the University of North Carolina and the University of Minnesota. His libertarianism was inspired by Ayn Rand, the self-declared philosopher and cult hero of the free market, with whom he was, for a limited time, close friends. Hospers encountered Rand in 1960 when she came to lecture at Brooklyn College. They met for lunch and were still avidly talking five hours later. That evening he “plunged into” her novel Atlas Shrugged, which was “heady wine” to him. He became infatuated with Rand and her scorn for altruism and state welfare. They would meet every two or three weeks and hold, till 4am or even 6am, talks that Hospers described as “among the most intellectually exhilarating of my life”. He was said to be the only person, bar one, who was able to debate amicably with the histrionic Rand. However, differences in opinion over determinism (she, unlike him, was a stern believer in unconditioned free will), the possible necessity of military conscription (which he, unlike her, advocated), and logic (which was not her forte), caused strains in their friendship, which she abruptly terminated in 1962 after he had publicly questioned her views on aesthetics. He never saw her again. Hospers continued to be influenced by Rand and to brood, often tearfully, over their relationship. His students and friends described him as a warm and delightful conversationalist and a wonderful listener. He antagonised many Libertarians by opposing one of their tenets – the open borders policy – in a 1998 article excoriating unrestrained Mexican immigration, and by defending the Iraq war in his revised edition of Libertarianism in 2007. By then, he had left the party and been instrumental in setting up the Republican Liberty Caucus. • This article was amended on 16 August 2011. The original stated without qualification that he was the first openly gay candidate for President but the article now reflects the familiy’s strenuous denial that he was gay. During the 1990′s I actually made it a practice to write famous atheists and scientists that were mentioned by Adrian Rogers and Francis Schaeffer and challenge them with the evidence for the Bible’s historicity and the claims of the gospel. Usually I would send them a cassette tape of Adrian Rogers’ messages “6 reasons I know the Bible is True,” “The Final Judgement,” “Who is Jesus?” and the message by Bill Elliff, “How to get a pure heart.” I would also send them printed material from the works of Francis Schaeffer and a personal apologetic letter from me addressing some of the issues in their work. My second cassette tape that I sent to both Antony Flew and George Wald was Adrian Rogers’ sermon on evolution and here below you can watch that very sermon on You Tube. Carl Sagan also took time to correspond with me about a year before he died. Artist Irving Petlin has led a remarkable life. He has enjoyed great success and mingled with groundbreakers and luminaries in two worlds – both in his creative pursuits and in his human rights efforts. He’s earned a reputation both for his art and for his role as one of the most recognized artist/activists who led the fight against U.S. involvement in the Vietnam War. And both his political and artistic pursuits have been of equal importance to him. In his long career as an artist Mr. Petlin has been acquainted with some of the world’s most successful contemporary artists, as well as a number of the legendary beat poets and writers. His work has hung in the renowned museums of the world, and he has spent time variously in Chicago, San Francisco, Los Angeles, New York and Paris – where he lives today – splitting his time between an apartment in the 5th Arrondisment and an 18th century farm in Chilmark. Running concurrently with his career as a painter and pastel artist, has been a lifelong commitment to political – in particular anti-war – initiatives. During the Vietnam War era Mr. Petlin was an organizer of both the Los Angeles Artist Protest Committee and the Art Workers Coalition in New York City. “I literally gave ten years of my life trying to end the war,” says Mr. Petlin, a strikingly handsome man, whose vitality and impressive mane of thick curly white hair bely his almost 80 years. Though he has spent summers living and working on the Vineyard for 38 years, the artist had never had a public showing of his work on Island – until this year. The A Gallery in Oak Bluffs has the distinction of being the first Vineyard venue to host an exhibition of Mr. Petlin’s dreamlike allegorical work. Elsewhere being prestigious galleries all over Europe and many of the major American cities including New York, San Francisco, Boston, Chicago, Philadelphia and Los Angeles. Petlin’s work is included in the permanent collections of New York City’s Metropolitan Museum, Whitney Museum, Museum of Modern Art and the Jewish Museum, the Pompidou Center in Paris, London’s Barbican Centre, the Hirshhorn Museum in Washington D.C., The Los Angeles County Museum, The Art Institute of Chicago, the Philadelphia Museum of Art, the Pennsylvania Academy of Art and Boston’s Museum of Fine Arts – to name a few. 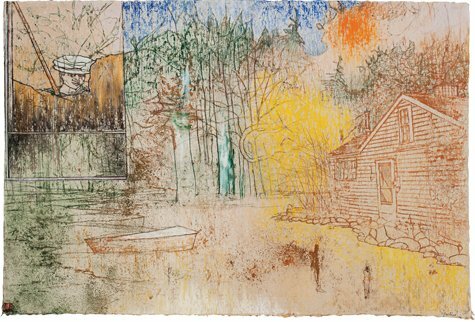 Mr. Petlin is known as one of the modern masters of pastel – a medium that he focuses on exclusively while at his summer home on the Vineyard. Through stark contrasts of color and varying textures, created in part by using the finest of handmade papers and a medium that lends itself to both fine line and atmospheric color, Mr Petlin creates works that are both visually striking and compellingly complex. They can be appreciated on dual levels – the aesthetic as well as the intellectual. Mr. Petlin proudly explains that the farm where he lives and works is the 13th oldest in Chilmark – having been constructed in 1719. The property includes four buildings – the farmhouse that was once an inn frequented by visitors traversing the length of the Island, the barn where the Petlins now reside, a windmill/pump house, and the creamery, a small cottage that was the couple’s first Vineyard home. While Mr. Petlin and his wife enjoy an idyllic existence today, the artist has thrown himself into the fray for most of his adult life – getting involved in the American Civil rights movement, anti-war protests during both the Vietnam and Gulf Wars and other conflicts in both the U. S. And Europe. From military man to anti-war leader Mr. Petlin, who is the son of Russian Jewish immigrants from Chicago, studied at both the University of Chicago and the Art Institute of Chicago during the height of the Chicago Imagist Movement. Among his classmates were sculptor Claes Oldenberg (a close friend) and pop artist Robert Indiana. In 1956 Mr. Petlin obtained a full scholarship to Yale University, having been recruited by famed artist and art educator Joseph Albers. Mr. Petlin earned a masters degree in painting before he was drafted into the army. It was while serving two years in San Francisco in military intelligence that Mr. Petlin became immersed in the world of the beats. “At night I met all of these people – Ginsberg, Corso, McClure. All of them,” he says. He also found time to paint – renting a studio in San Francisco’s famed Bohemian center, the Monkey Block. After completing his military service Petlin travelled to Paris on a Ryerson fellowship. En route he met his wife Sarah, to whom he is still happily married today. In Paris Mr. Petlin started to enjoy critical and popular success as an artist. He showed his work in the same gallery as some of the prominent surrealists of the day included Max Ernst and Roberto Matta. He met Giacometti and Balthus, among others. As much as he loved the Paris scene and his life there as a family man, Mr. Petlin was drawn back to the home of his birth by a sense of duty. In 1963 The couple moved to Los Angeles. Mr. Petlin served as a visiting professor at UCLA. The time was a precarious one is the U.S. with the conflict in Asia on the verge of dividing the nation. “It was the beginning of the artist movement against the war in Vietnam,” says Mr. Petlin. Mr. Petlin was among the most actively involved of American artists working towards peace. As one of the founders of the Los Angeles based Artists Protest Committee, he organized the erection of the Peace Tower, a 58 foot steel tetrahedron by sculptor Mark Di Suvero which displayed over 400 paintings donated by artists including Robert Motherwell, Mark Rothko, and Frank Stella . Among those who were drawn to rallies at the Peace Tower were Susan Sontag, Ken Kesey and the Merry Pranksters. Mr. Petlin recalls defending the tower against vandals during the four months that it stood as s symbol of protest. He famously warded off one would be attacker with a broken lightbulb. In 1966 the Petlins moved to New York City where Mr. Petlin spent worked as a professor at Cooper Union. He continued his involvement in the peace movement, playing an important role in the Art Workers Coalition’s (AWC) opposition efforts. The AWC was a organization comprised of artists, art critics and dealers that took on many of the major art institutions in New York City on a variety of civil rights issues. By this time, Mr. Petlin had become very well respected in the international art world. His work was being sold in galleries throughout Europe and the U.S. He had been among the artists included in the Paris Biennal (1961), the Whitney [Museum of Art, NYC] Biennial (1973) and the Venice Bienale (1982). Although early on in his career he was influenced by the surrealists and abstract expressionists, Mr. Petlin eventually forged his own style, using, variously, pastels and oils, to depict dreamlike landscapes featuring allegorical figures. He sometimes employs diptychs or triptychs to tell a complex story, generally one with a political or a humanist message. The pastel drawings and paintings are often dissected giving a kaleidoscope effect, or feature figures separated from the scene by a small frame, or hovering ghostlike over the landscape. All of the elements have symbolism – from the sketchy city skylines or massive mountainous backdrops, to the often faceless, sometimes indistinct or only partially realized figures. Some symbols are repeated like the image of “the stopped watch” featured in a series of pastels from a recent Paris exhibit. The watch represents the timepiece found in the rubble after the bombing of Hiroshima. The artist’s palette covers a wide range. He uses contrast – vivid blues, yellows and reds punctuating stark sepia and earth toned landscapes. Mr. Petlin purchases all of his pastels from the Maison de Pastel de Henri Roche, who have been hand making pastels in France for years and were the suppliers for Degas, Redon and other artists of note. Mr. Petlin explains that the sticks are pure pigment from nature hand rolled today by two women who jealously guard the secret to their purity and brilliance. At his studio in Chilmark, boxes of these pastels draw one’s attention. They are remarkable for their striking color and – whittled down by use into a variety of shapes and sizes, and sorted into color groupings in wooden boxes – they present a form of artwork on their own. Mr. Petlin uses his time on the Vineyard to create work that he will then show in Paris during the fall and winter. However, this year, in a reversal of tradition, he worked on the Vineyard paintings all spring in Paris so that he would have a body of work ready for the A Gallery show in August. Appropriately then, given the distance from his subject, the theme of show draws on the quality of recollection and imaginings. The personal is very much the focus of one of the trio of series in the show. “The Cottage” drawings feature the Creamery – the same Chilmark structure that was the very first home that Mr. Petlin owned, and that represents his fond memories of his past life with his family on the Island. The Petlins, along with two other families, scraped together enough money to collectively purchase the property in 1976. The cottage, where Petlin, his wife and two children, spent many a summer, holds fond memories continuing on through the present day when children and grandchildren now come to visit. The second series “The Fish and the Boat” are representative of the very essence of the Vineyard itself. “The Three Brothers” series envisions a scene where Mr. Petlin and his siblings are united on the beach, something that has only occurred in the artist’s imagination. Mythology has always played a part in the artist’s work. As has the idea of the elusive and shifting nature of memory. He has a tendency to draw on Greek myths, Biblical stories, Shakespeare and a host of other sources to comment on current situations or universal themes. The artist’s work has a dreamlike quality with figures overshadowed by the landscape but, still, very much the focal point. There is something somewhat foreboding about Mr. Petlin’s images, a sense of unrest, a seeking. His landscapes have an almost apocalyptic feel. There is clearly a sense of both a universal and a personal voyage – one whose realization is, as yet, undetermined. Mr. Petlin’s own remarkable odyssey – his struggles, his victories and his frustrations – have certainly informed his work. Still, the overarching message is one of optimism. A characteristic understatement from a man whose selflessness is matched only by his gentle humility. Irving Petlin (born December 17, 1934 in Chicago, Illinois) is an American artist and painter renowned for his mastery of the pastel medium and collaborations with other artists (including Mark di Suvero and Leon Golub) and for his work in the “series form” in which he uses the raw material of pastel, oil paint and unprimed linen, and finds inspiration in the work of writers and poets including Primo Levi, Bruno Schulz, Paul Celan, Michael Palmer and Edmond Jabès. Petlin attended the Art Institute of Chicago from 1953-1956 where he received his BFA during the height of the Chicago Imagist movement. At a critical juncture Petlin attended Yale to study under Josef Albers, subsequently earning his MFA in 1960. In 1964, his work was shown at the Hanover Gallery in London and Galerie du Dragon in Paris, where he influenced the Nouvelle figuration (fr) movement. That same year, Petlin was invited to teach at UCLA as a visiting artist, along with artists Richard Diebenkorn and Llyn Foulkes. While in California, he was a principal organizer of the “Artist’s Protest movement against the war in Vietnam.” In open meetings held at the Dwan Gallery, of which John Weber is the director, he founded the Artists’ Protest Committee. In 1966, Petlin planned the Peace Tower with help of Mark di Suvero, as well as Philip Lieder, Craig Kauffman, Larry Bell, Walter Hopps, Rolf Nelson, Judy Chicago, Lloyd Hamrol, Hardy Hanson, Eric Orr, Tanya Nuefeld, and others. “The Artists’ Call” for the tower is published in four languages, and works arrive from all over the world to be attached to it. The finished tower, was dedicated by Susan Sontag and untimately attacked overnight. The following year, in 1965, Petlin had his first major one-man exhibition held at the Palais des Beaux Arts in Brussels. Shortly thereafter, he returned to New York with his family and moved into an apartment on West 11th Street. At this time, his growing commitment to the American milieu resulted in the completion of the painting The Burning of Los Angeles. During this period, Petlin is a founder and a participant in Artists and Writers Against the War in Vietnam, the Art Workers Coalition, the Art Strike, the Moratorium, the Venice Biennale. Since the 1960s, when he became one of the founding members of “Artists and Writers Against the War in Vietnam,” Petlin has been a leader in artists’ political activism. He created the iconic anti-Vietnam War poster And babies in 1969. Petlin has continued his militant interventions after the 1960s through such activities as his participation in the “Artists’ Call Against the U.S. Intervention in Central America”. Petlin has taught at the University of California, Los Angeles, the Cooper Union in New York, as well as the Pennsylvania Academy of the Fine Arts in Philadelphia. He currently resides in Paris, New York and Martha’s Vineyard, Massachusetts. 1989 A Different War: Vietnam in Art. Whatcom Museum, Bellingham, WA. Curated by Lucy Lippard. ^ Jump up to:a b “Irving Petlin: A retrospective”. Absolutearts.com. 2010-01-29. Retrieved 2014-06-02. Jump up^ International School of Painting, Drawing, and Sculpture in Umbria, Italy Archived November 12, 2009, at the Wayback Machine. “Irving Petlin: The Committed Brushstroke by Peter Selz.